Pledged by Bishop to the Town Council. Town in the Prussian province of Hanover. At what time Jews were first admitted to this old episcopal city is uncertain. In a document of Jan. 7, 1347, mention is made of the taxes to be paid by the Jews. The bishops of Hildesheim exercised the right to receive Jews under their protection ("jus recipiendi Judæos"), while the town council also claimed this privilege, and exercised it for many centuries. Memor-books mention Hildesheim among the martyr cities at the time of the Black Death (1349); but Jews again settled in the town as soon as 1351. On Jan. 6 of that year Bishop Henry III. granted them a burial-ground; and by a grant of Bishop John III. (Nov. 30, 1405) this plot was enlarged. In the "Judenstrasse" (which is first mentioned in official documents in 1381) the Jews were in 1385 permitted to have a synagogue ("Jodenschole"); this was built on property belonging to the town, for which they had to pay an annual rent of 4 marks. The Jews and Jewesses paid to the town council a total annual rent of 5½ marks for their dwellings (one ferding each; the Jew Keneka, however, had to pay 2 ferdings). On July 27, 1428, Bishop Magnus pledged the Jews in the town and bishopric of Hildesheim to the council as security for a loan of 600 Rhenish gulden; and the same prelate granted them on Aug. 26, 1439, a privilege of protection, which in 1441 received the sanction of the council. The council also signed an agreement with the Jews regarding their admission,government, and right to leave the town, whereby the original number of families was put at 12, exclusive of the "Sangmeister" (ḥazzan) and "Schulklopfer" (sexton); the Jews paid a yearly tax of 60 Rhenish gulden to the town, apart from the rent for synagogue and dwellings. Their internal affairs were administered by four sworn councilors. After the council had admitted (Aug. 9, 1450) some Jewish families into the town for six years, all Jews were, in 1457, exiled from the diocese. Some of them found an asylum in Brunswick. The administrator of the bishopric, Bernhard, bound himself, according to a document dated March 29, 1457, not to tolerate in the future any Jews in the see of Hildesheim. The synagogue was torn down; the emperor confiscated the valuables belonging to it; and the territory of the cemetery, where also Jews of other places had buried their dead, was assigned, with its tombstones, to the provost of the cathedral, Ekkehard von Hahnensee, as a site for St. Ann's Church and the hospital of the same name in the "Neustadt" of Hildesheim. It was more than sixty years later when, at the time of the chapter feud in 1520 under Bishop John IV., a Jew called "der grosse Michel" was admitted to the city on account of his skill as a warrior. He was soon joined by other Jews, as, for instance, one Leifmann, who instructed the clergy in the Hebrew language. Leifmann was even allowed to remain when, in 1542, the other Jews were exiled once again. Elector Ernst II. of Cologne, Bishop of Hildesheim, who had his Jewish physician, Medicus Herz (of Hamm), admitted into the city, promised (Nov. 29, 1585) protection to the Jews; and the council also afforded them protection (1587). Only a decade later, however (1595), they were again driven out of the city, owing to Nathan Schay and Marcus having, after the death of their wives, married the latters' sisters, which example was followed by a Christian physician, whereupon the head pastor. ("Hauptpastor"), Hesshusius, declared the marriages incestuous. The exiled Jews instituted proceedings against the council before the supreme court of the empire as well as before the imperial court in Prague. A decision was rendered in their favor; and the council, through the intervention of the electoral government, on March 4, 1601, came to an agreement with the Jews whereby the latter were permitted to return to the city on the following day. Eight years later, when they were accused of being the cause of the plague, they were again forced to leave the city; they were, however, soon readmitted. Previous to this (1607) the council had given three houses to Nathan Schay and his family in recognition of his valuable financial services to the city. In a building in the rear of this property a synagogue was established, the continuance of which was permitted by the council in 1615 in consideration of a large money payment. A new cemetery also was allowed the Jews by the provost, in the neighborhood of their former burial-ground. In 1650 this was replaced by another cemetery, which was enlarged in 1741. During the Thirty Years' war the Jews of Hildesheim were heavily taxed. Thus in 1621 they were required to pay to the lords 150 gulden, and in 1622 as much as 250 to 400 gulden, a month; and they were threatened with expulsion if they refused. On account of these large payments the few Jews—10 in the city, and 4 in the neighboring village of Moritzberg—were so impoverished that their combined belongings in 1634 did not amount to 2,000 thalers. In 1660 protection was withdrawn from the Jews (with the exception of the heirs of Nathan Schay and Herz Israel), and it was not again granted to them until they had bound themselves to pay 500 thalers. On Aug. 9 of the same year the council issued a "Juden-Geleits-Brief," to which on Oct. 24, 1662, was added a letter of protection from the bishop, Elector Maximilian Henry of Bavaria. In the same year, 1662, a new constitution was adopted, which remained in force for more than 150 years thereafter. Six years later (19 Elul, 5428 = 1668) pious men joined in the establishment of a benevolent society ("ḥebra ḳaddisha shel gemilut ḥasadim") in Hildesheim, which society is still in existence. In the eighteenth century from 40 to 60 families were offered protection in the city. During the Seven Years' war the Jews of Hildesheim were not freed from the burden of heavy contributions and numerous taxations. In 1758 they had to pay a per capita tax and to supply beds, sheets, etc. After the cessation of the prince-bishop's secular power the Jews of the diocese of Hildesheim were for four years (1802-06) subject to Prussian rule; but under Westphalian government (1806-15) they enjoyed full liberty and equality with the other inhabitants. In the canton of Hildesheim there were, in 1812, seventy-seven Jewish families, all of whom lived in the city. At that time a Jewish elementary public school was founded with the cooperation of the consistory in Cassel; it still exists. 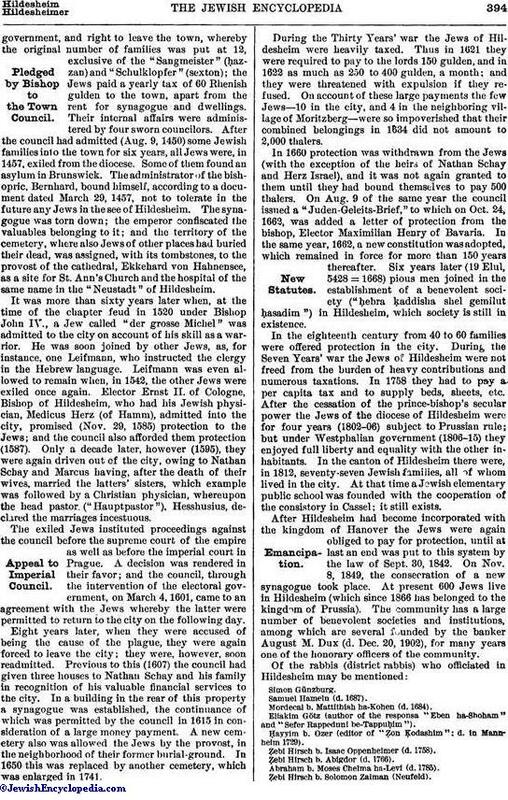 After Hildesheim had become incorporated with the kingdom of Hanover the Jews were again obliged to pay for protection, until at last an end was put to this system by the law of Sept. 30, 1842. On Nov. 8, 1849, the consecration of a new synagogue took place. At present 600 Jews live in Hildesheim (which since 1866 has belonged to the kingdom of Prussia). The community has a large number of benevolent societies and institutions, among which are several founded by the banker August M. Dux (d. Dec. 20, 1902), for many years one of the honorary officers of the community. Mordecai b. Mattithiah ha-Kohen (d. 1684). Eliakim Götz (author of the responsa "Eben ha-Shoham" and "Sefer Rappeduni be-Tappuḥim"). Ḥayyim b. Ozer (editor of "Ẓon Ḳodashim"; d. in Mannheim 1729). Ẓebi Hirsch b. Isaac Oppenheimer (d. 1758). Ẓebi Hirsch b. Abigdor (d. 1766). Abraham b. Moses Chelma ha-Levi. (d. 1785). Ẓebi Hirsch b. Solomon Zalman (Neufeld). Menahem Mendel Steinhart (afterward member of the consistory; d. in Paderborn; author of the responsa "Dibre Menahem" and of "Dibre Iggeret"). L. Bodenheimer, chief rabbi of Krefeld (d. 1867). M. Landsberg (d. May 20, 1870). J. Guttmann (since 1892 rabbi of the community in Breslau). 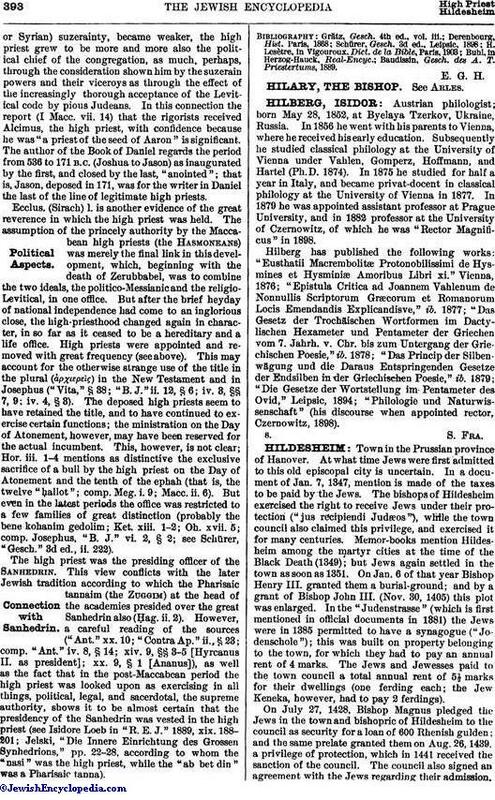 Since Nov. 4, 1892, Dr. A. Lewinsky has been the district rabbi of Hildesheim. 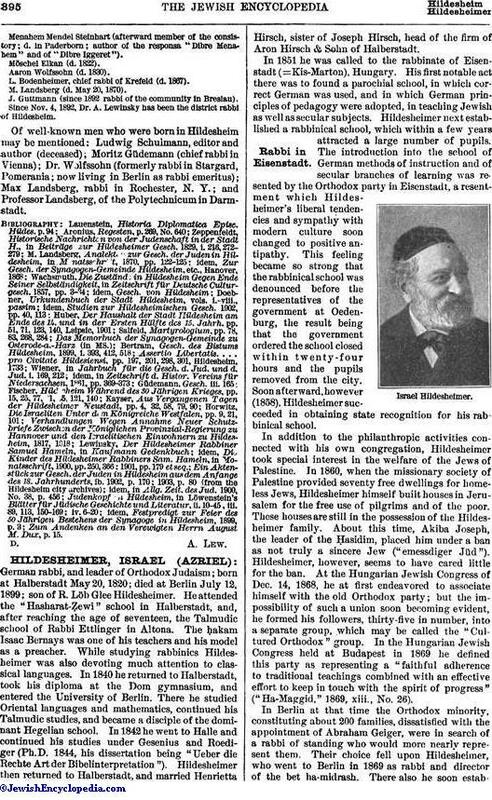 Of well-known men who were born in Hildesheim may be mentioned: Ludwig Schulmann, editor and author (deceased); Moritz Güdemann (chief rabbi in Vienna); Dr. Wolfssohn (formerly rabbi in Stargard, Pomerania; now living in Berlin as rabbi emeritus); Max Landsberg, rabbi in Rochester, N. Y.; and Professor Landsberg, of the Polytechnicum in Darmstadt. Zum Andenken an den Verewigten Herrn August M. Dux, p. 15.